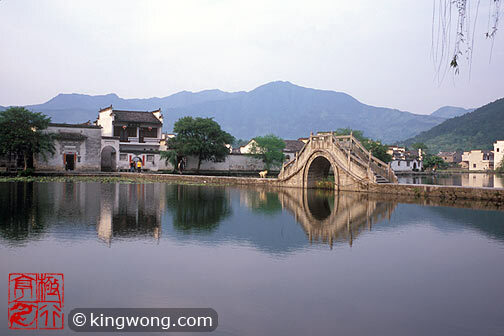 The small fanciful stone bridge, 画桥 Huaqiao (literally, Picture Bridge), was built in 1986 when tourism was on the rise. It sits halfway, closer to the south, through a causeway that spans the middle of the South lake. In the background id the full view of the 雷岗山 Leigangshan hill.